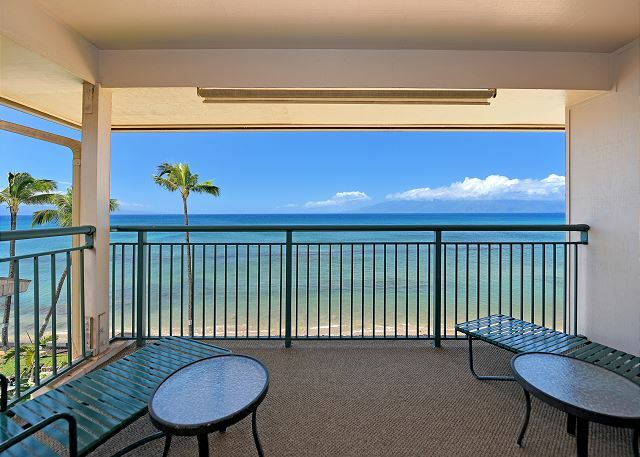 Makani Sands #301 is a spacious corner 3 Bedroom, 2 1/2 Bath townhouse on the 3rd & 4th floor corner, with an incredible view of the ocean. 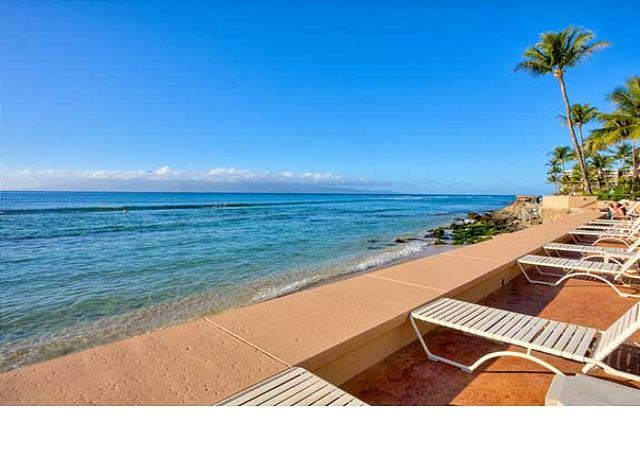 Decorated in a traditional Hawaiian style, this beautiful townhouse comes equipped with 3 cable TVs, VCR/DVD, CD player. There is a full kitchen including a conventional stove and a microwave. There is a large round dining room table for family meals. Spend some nights at home cooking up fresh fish on our beachfront BBQ, or settle down and relax and spend a day sunbathing out front. Upstairs there is a king bed in the master bedroom on the ocean side with a private bath, and a king bed in the guest bedroom on the mountain side. Downstairs, there is a 3rd bedroom with twin beds. 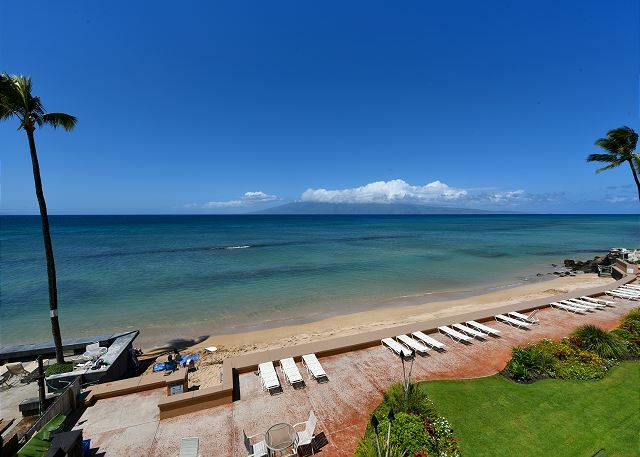 Enjoy a day on our beach snorkeling, swimming or kayaking right outside your door! 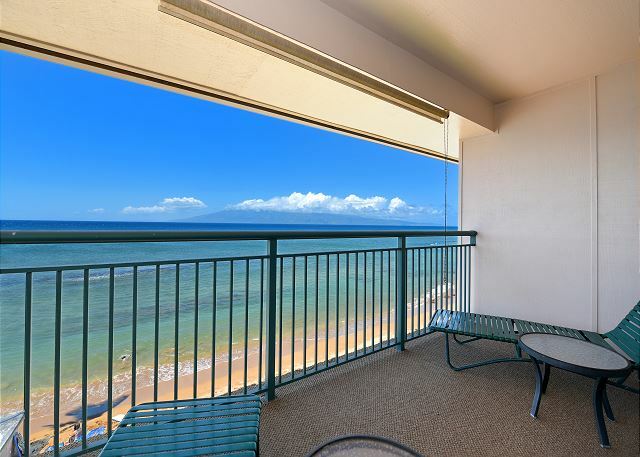 Come and experience Maui & stay in condo #301, your home away from home on Maui! Our stay at Makani Sands was amazing! The vacation rental was in the best location. Oceanfront, walking distance to farmers market, beach walk pathway, grocery and food stores. The condo was clean and in good condition. The vacation rental management staff was very nice and helpful. We will stay here again next year. This place is so close to the beach. You can hear the waves throughout the day and the birds. The view is beautiful and scenic. The staff were wonderful and helpful. All instructions and directions were clear and concise. There were a couple of things with the unit that did not work, but nothing that impacted our stay. We will go back. 1. The good. Great location. On the water. Sunsets beautiful. Saw more turtles here than any other West Maui beach. Like clock work, every 3 pm they come to eat. Big ones, small ones. Great snorkeling. Waist deep water. Nice reef with lots of fish. 2. The ok. Not bad. But ok. Condo is older and it shows. Bedrooms, bathrooms, doors all show their age. First floor bedroom stays warm even with AC. Could’ve been a bit cleaner upon arrival. 3. Overall. I would stay again. This is not the Ritz but for a family of 5-6 people, plenty of room, great location, walk to Honokawi Beach, and lots of turtles. Condo has everything you need. Kitchen is fully equipped, beach chairs and towels were provided, and you can't get closer to the water! Beach is lacking at the property but that didn't stop other guests from swimming. a guest from Winters, CA does not recommend this vacation rental. The property description was accurate regarding the location, layout and amenities. What was not accurately decribed was the condition of unit 301. The unit was clean considering it is in need of upgrading. The back bedroom on the second floor had the air condition unit that cooled the second floor. Unfortunately the unit was loud and birds are nesting in the unit. When the unit is off the birds noise was a nuisance. The mattress in the back bedroom also needs to be replaced; it had a deep wallow on one side. The frame was broken and the handyman came by to repair as soon as he was able to. The master bedroom on the same floor with the oceanview was fine. The bathroom faucet had a slow drip and that was reported to the office. The shower liner had to be replaced and that was done promplty. The main floor bedroom with twin beds was hot even with the air conditioner on. With that said we all enjoyed the view and location of our accommodations. The complex was clean and quiet and the office staff were great to work with. Pool was super clean and landscape was beautiful and kept up. Process was simple and Marie and Loren were always available and extremely helpful. Great view, comfortable, a bit pricey for condition of place. Had everything you needed. If I return to maui I will most likely stay at a different place. Not that it was a bad place just like to try different things. The pictures showed a private beach, not the case at all. Amazing vacation with my family. We had a 2 story condo right on the beach. 3 bedrooms with 2 1/2 baths that was fully furnished. The beach is eroded away but the views and rocks were awesome. Turtles and whales everywhere. A nice place to stay. Clean with very friendly staff. Have stayed at Makani Sands 4 times. This condo has a beautiful view of the ocean from two different floors. The property has a small, very secluded beach that had nice sand, great snorkeling with tropical fish and many, many turtles. You are roughly 10 miles from Lahaina, which is just right. This was a very nice location for our family. We had a great time. Beach front was a big plus. The condo is just right for those looking for mid-range property. It is right on the beach, where some regular turtles visit (Tripod - with three legs, VW - due to the shape of his shell, and a third unnamed one). The outside of the condo (the rear) looks dated, but the inside is quite nice. There is a decent beach in the front, but the water does get a little choppier in the afternoon. Still decent snorkeling in the mornings as there is also a reef right in front (probably why the turtles like to hang out here). The condo was very clean and well taken care of. The AC is in the top rear bedroom, so best to turn it off at night as it hums otherwise. There is a lanai off the top bedroom as well as the living room. Given the sun exposure, you will likely have to close the drapes in the late afternoon. The property is less than a mile away from a small organic grocery store and park. You also have kayaks, boogie boards and surf boards to use. The condo had beach chairs and an umbrella for use as well. Amazing view, can't get closer to the beach! Gorgeous turtles. The waves can get really loud at night so bring ear plugs! The location is fantastic, particularly access to the beach/ocean to see the turtles. The maintenance of the unit was a bit lacking and in need of repair/upgrading in certain cases. Those issues were noted in the questionnaire left with management. That being said, it was a nice unit overall. The beach chairs, towels and boards that were available were much appreciated. Yes......we will certainly be back !!!! This is our second visit to Maui within the past 12 months and we absolutely loved our stay in Unit 301 at Makani Sands !! 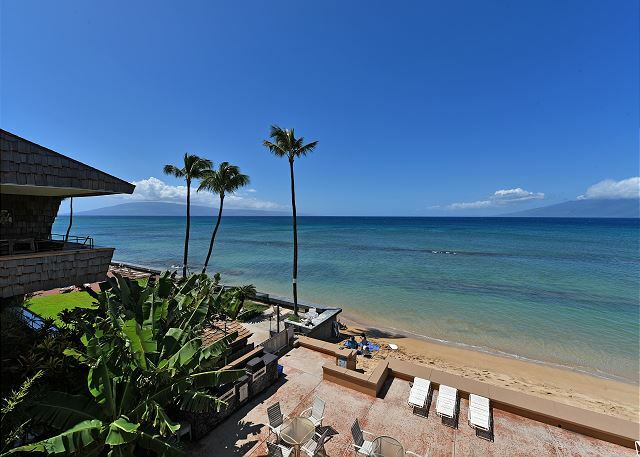 The location is beyond perfect, with a beach/oceanfront, double lanai condo set it the midst of west Maui's little beach community just north of Kaanapali and south of Kahana. The condo unit is a small one which makes for a more intimate setting. Older, yes.....but in pretty good shape considering. Many upgrades in unit 301 and plenty of room for our 6 guests for the week with three bedrooms and 2-1/2 baths. The property manager, Burt, was beyond hospitable and friendly. We are not sure when we will be returning to Maui, but when we do, we know exactly where we will be staying. The condo had everything we needed for an enjoyable, comfortable stay. The best part were the beautiful balcony views and relaxing sounds of the ocean. 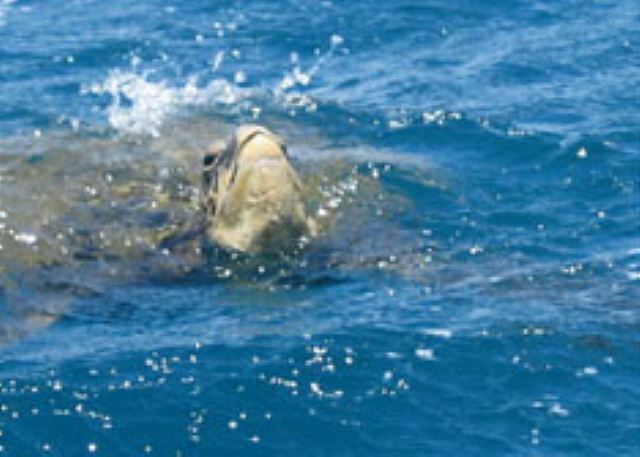 We were even lucky enough to see a sea turtle right on the shore the day before we left! We enjoyed our stay, wish we could have stayed longer. The only negative comment we have is that the grills close at 9. This means they turn the gas off 9pm sharp. It was cold and raining so it took a long time for us to cook, but we were braving it with umbrellas. Our food was not cooked and we had to move everything inside to finish up in the kitchen. We stayed here for 10 nights with 4 adults and 2 children. We all felt like we had plenty of space and were comfortable. Very clean condo and the views of the ocean are insanely gorgeous. I felt like I needed to be pinched every morning to remind me it wasn't a dream. The only down side to this condo is the noise in the second master. The AC unit powering on and off and the constant street noise left us without much sleep. But we have 2 young kids and are used to sleepless nights. And to be fair, I don't think this issue is really "fixable" by the owner or management so I would recommend ear plugs for sure in that room. But honestly overall, it was amazing. We would definitely stay again! Oh and a special shout out to Bert - who was so wonderful and kind throughout our stay! We had an enjoyable stay in Maui. We had pretty good weather while we were there. Initially we had serious problems with the air conditioning which was not working. The staff was able to get the air working after approximately 24 hours and it was fine after that. It made our first 24 hours very uncomfortable. We were happy with the unit that we stayed in. The carpets are a little rough and should be replaced, but generally the unit was clean and had everything we needed. The beach was awesome. We would definitely recommend this location. We stayed in Unit 301 which was a little dated, but the setting was stunning. Sitting out on the deck you look out to the sea, private sandy beach and the immaculate garden/lawn. The sunsets were awesome. We were a family of 5 adults and the unit had plenty of room for us all. After we had left we realized that we had left some clothes in the dryer. The property manager was great, she got a quote for posting it to our next location and organised the delivery. Location was great. The neighborhood has lots of places to shop nearby, with super markets, and smaller take out restaurants. For the price I would highly recommend this place for a group like ours. We had a party of 6 stay in unit #301 from July 15-22, 2016. Upon arrival this property was just as described online. The views are amazing and so much better than the pictures online. You can't get much closer to the water! We loved that we were close to everything but without all the crowds. Our favorite thing was waiting for night to come and having the Sea Turtles come rest right on the beach. Amazing! The staff on site are very helpful with anything you need. We will definitely be back to this great property! What a great place to stay for our extended family vacation. Most always we had the beach in the back to ourselves with turtle swimming by every day. They love to sneak up on you so you will jump as they swim calmly past you. Our four-year-old grandson loved the calmness, most times, of the waves in the morning and swimming in the pool late afternoon. Our son and son-in-law learned to blow the conch shells, graciously provided, at sundown. The condo was very comfortable for the seven of us and was located half way from shopping on the south and a wonderful snorkeling and child safe beach on the north. The managers were on vacation (where do you go for a vacation when you live in Hawaii?). The fill-in folks did a great job and we always got our questions answered. Family is already talking about returning and we definitely will. a guest from Anthem, AZ does not recommend this vacation rental. Great location & view. Partially updated condo. Kitchen has been updated, but is tiny. Very tight spaces. Living area is small. 1 downstairs bedroom, but only powder bath on first floor & other two baths are en suite, making it a bit awkward. Beautiful grounds, but building feels dated & was under construction. AC is partial at best. Two bedrooms have only screens (no windows) & are not sound-proof. Had it not had a view, we would have been very disappointed. Great place.Has it all, views, snorkeling, sun, coral reef, lots of fish and beautiful sea turtles that beach themselves late in day. Also when on your deck ( 2nd floor or higher) you can see the seaturtles swimming by in their playful flips. BBQ's available and fun evening gatherings at sunset with owners and other renters to blow the conch shells. Great rental and maintenance staff aka Roseanna & Burt! Older condo complex with a great location and beautiful views! We saw whales every morning while having breakfast on the terrace! We found the property perfectly located on the beach. Very spacious, had every amenity. Full loaded kitchen. Wonderful place to gather with family. Good beds. Very comfortable! We would visit again! Older condo complex but in great shape. Private pool for guests. Private Beach. Good location. Turtles in the beach/reef area. good snorkeling and swimming from the beach. Great location and staff. Will stay here again. Our family thoroughly enjoyed our stay. Although our unit could use a bit of updating, overall it was great for the 3 couples. The location is beautiful; we were able to watch whales and the sea turtles from our lanai. And super comfy beds and nicely appointed kitchen! Overall about an 8 out of 10. We loved the property! You can't buy a better view or position tight on the ocean. The property is the perfect size for a relaxing vacation away from crowds. The beach area was clean and we loved to watch the sea turtles and whales which appeared frequently. The staff at Makani Sands are wonderful! They were very helpful and extremely friendly. The unit was clean and though a bit dated if you were looking for glitz however it felt like home. We had everything we needed for our stay. My family and I enjoyed our time at the Makani Sands. Kitchen was very well stocked with dishes, knives, cookware and ice. Use of a washer and dryer available, since we had 3 small children was great. Outside maintenance was very good, Bert was always busy doing something to beautify the place and he was very friendly and accomodating. We had some issues with insects (ants) in the kitchen, important to put foods in the fridge or plastic. BBQs were very clean and all the tenants shared them in a timely manner. View from the lanai for whale watching was fantastic. This was my 4th time staying at Makani Sands. The location is very private, beach is great for snorkeling. It's quiet, pool is nice, close parking, gorgeous views. I have always been very pleased with the accommodations and condition of the condos. We have previously stayed in a 3 bd unit (#305) and 2 bd (#209). Both were remodeled and beautiful! Everything you could want, gorgeous kitchens, bathrooms. This time we stayed in 3bd unit (#301) because it was the only one available. It was the same price as #305, but the condition & finishes on the condo left much to be desired. For example the floors were warped, old/small kitchen, damaged/marked drywall, broken lanai door, old carpet, pin-nail tacked backsplash. It was acceptable, but I really don't think it should command the same rate as some of the other condos with granite, S/S appliances, updated bathrooms and recent remodels. We were there with a large party including small children, so the size & safety of the condo was the most important thing, it just wasn't up to my previously established expectations. Also, the manager was not on site 4 of the 5 times I looked for her during business hours, including check out. I didn't know what to do with our keys, etc... I ended up just putting them in the office mailbox and heading to the airport. I WOULD stay there again, but I would be VERY selective about which unit I chose in the future. The property is well maintained and has a beautiful view of the water where we were able to view whales and sea turtles from our balcony. The property is also within walking distance of several shopping centers, and a park. We stayed in Unit 301. This particular unit has all of the comforts of home, but is in need of a little updating( floors looked worn, had to put towels down because the rain came in from outside through the glass panel windows, sliding door lock held open by masking tape, etc.). With that being said, overall we had a wonderful time, and you can't beat the view from the condo balconies. We arrived on a saturday afternoon, and were greeted by whales breaching out in the ocean in front of our condo! Everything about the condo was what we were hoping for. Lots of room for everyone, nice view, on the beach!! Everyone at Makani Sands were very friendly, guests and staff alike. We will be back!!! Beautiful. Great sunsets. 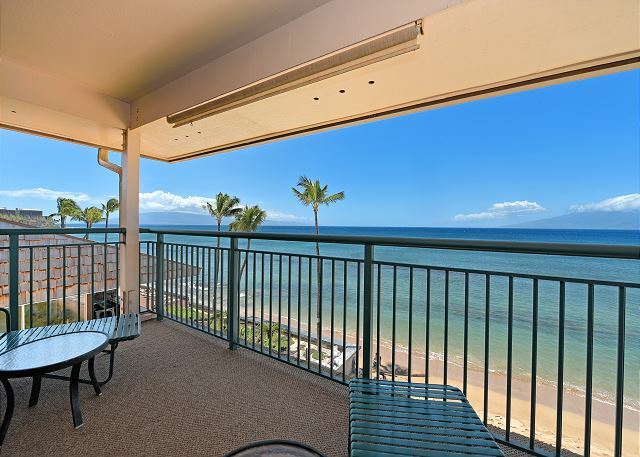 Everything we were looking for and hoping for in a Maui condo. We found our unit to be clean and ready for us when we arrived. The beach and view were a definite bonus. The unit handled my family of six without a problem. They ranged from 19-11 years of age. I would suggest barbecuing by the beach every night. Now when I barbecue in Missouri I just pull up the view from Maui to remember how good it was. During July 2014 my family of nine people had a wonderful stay and accommodations at Makani Sands, units 301 and 210. This was my third visit to Maui and I have stayed at Makani Sands each time. The facility is located right on the beach, with private access to the beach and snorkeling for the guests and residents. The balconies face west, and we were treated to excellent sunset views each night. We also enjoyed (twice) using the gas BBQ grills to cook steaks and burgers. The grills are built into a very nice granite countertop configuration. After checking prices of nearby hotel rooms, my conclusion is you get a much better value by staying at Makani Sands since each unit has a fully equipped kitchen and private laundry facilities. 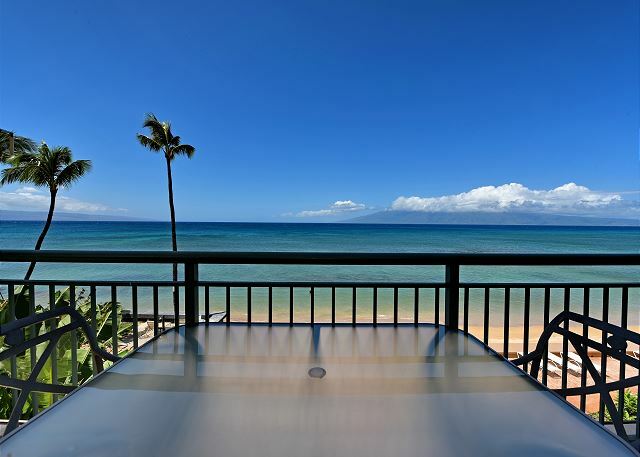 I fully recommend Makani Sands Condos to anyone considering travel to West Maui. 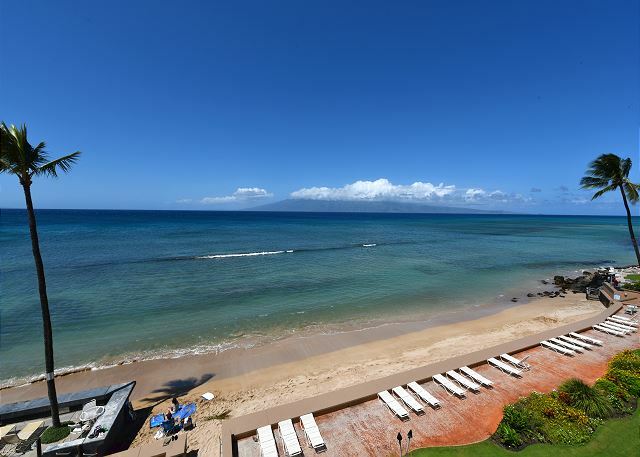 The town of Lahaina is only 6 miles to the south which offers great dining and shopping. There are also several excellent golf courses within a 5 mile radius including Kapalua. We stayed in unit 301 and it is very spacious and nice. It is hard to find a 3 bedroom unit to accommodate large families. The maintenance man Bert is awesome and he goes out of his way to offer you gear if they have it (usually left behind by previous guests like me!) I would check-in and talk to him before buying or renting anything. Bert is also very knowledgeable about the area, restaurants, etc. The location is great and the small beach access is awesome! You will see many Sea Turtles during your stay and its great for paddle boarding or just letting the kids play in the sand. The beach isn't great for snorkeling/surfing. The pool is a also an added benefit for all! Great experience. The view was wonderful, we saw turtles and whales from our deck. The unit was very comfortable but could be updated a little. We had the best vacation at Makani Sands #301! 9 nights was a perfect amount of time. 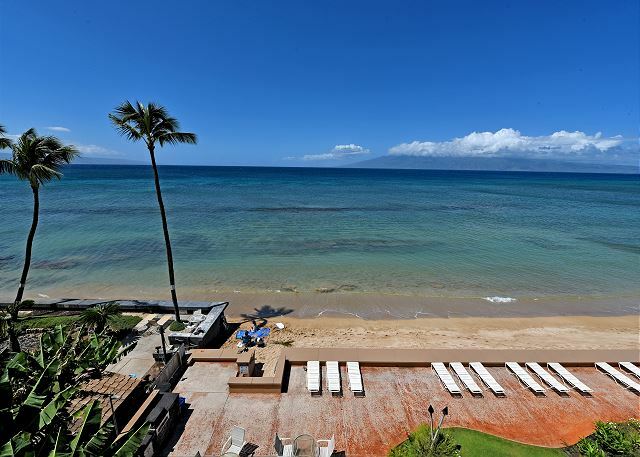 Love the location, very quiet, the beds were very comfortable, really enjoyed both lanai's for watching whales & turtles. We will be staying here again in the future. Thanks again to Roseanna & Bert for all your help ! Great place, enjoyed being right on the water, but you need to put batteries in the smoke alarms.